A goddess gearing up for action. Art by Cliff Chiang and Matthew Wilson. Since the New 52 initiative began at DC Comics, the Justice League has turned into a very successful franchise. Batman and Superman, DC’s most popular characters, belong to the main Justice League team and battle nefarious goings-on in DC’s flagship title “Justice League”, along with Wonder Woman, Aquaman, Flash, Green Lantern, and Cyborg. The members of the “Justice League Dark” book come from the supernatural side of the DC universe, comprised of such characters as John Constantine and Deadman. “Justice League of America” has heroes directly recruited by the U.S. government. Even a JLA member has his own book with the JLA name emblazoned on the cover: “Justice League of America’s Vibe.” DC could definitely expand their Justice League franchise in many ways, despite the prevalence of books in this franchise. That, though, is speculation for another time. There’s one character in the Justice League family, though, that deserves particular attention and a franchise all her own: Wonder Woman. Diana, the Amazonian princess, clearly deserves more exposure and more stories told about her. Batman has many of his own solo and related Bat-family titles. Superman has a handful of titles, along with Superboy and Supergirl. 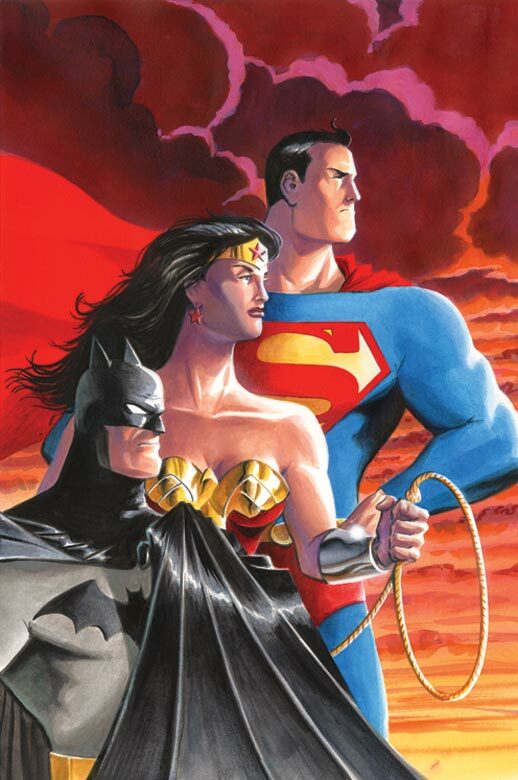 There’s even a team-up book with Batman named “Batman/Superman and now book with Superman and his partner in crime-fighting and love titled “Superman/Wonder Woman”. Wonder Woman only has one solo title, and the new book with Superman is a good start in the proliferation of more Wonder Woman lore out in the world. Wonder Woman clearly deserves more books, if not for one simple reason: she’s one third of the trinity of superheroes in the DC universe. Although this may be true, you wouldn’t think so by glancing at the shelves at your local comic book shop. She is clearly gaining more acclaim for her character through Brian Azzarello’s critically lauded book and her role in the Trinity War crossover in the three main League books by Geoff Johns and Jeff Lemire. More stories can and should be told about her and the mythos surrounding her character. She deserves a franchise all her own. A Wonder Woman, Incorporated, if you will. There are many ways DC can go about franchising Wonder Woman. She already has an amazing book written by Azzarello. He’s built a mythos surrounding Diana and populated her book with a rich supporting cast. He’s even changed her origin, with Zeus revealed to be her father. There could easily be another solo book created by an amazing artistic team, if only given the chance. The second solo title could explore her experiences and adventures on Earth and include smaller, more personal story arcs. Wonder Woman’s reaction to her newly discovered origin could be fleshed out through her interactions and adventures with one or more characters at a time. The second solo title could possibly have alternating arcs where we discover how she met different supporting characters, such as Steve Trevor. We still haven’t seen how they influenced each other and how their relationship formed and blossomed over time. DC has a perfect possible spin-off book for Diana that can be unique and full of family drama. The supporting cast of gods, goddesses, and demi-gods and goddesses (along with a few humans, such as Zola) would be a family book unlike any other on the comic book stands today. Diana could probably make sporadic appearances, but all the focus would be placed squarely on the lives of Diana’s family of gods such as Ares, Apollo, Hephaestus, Hermes, and many more of the other characters expertly introduced by Azzarello in Diana’s flagship title. Although the book will have larger than life characters and the setting will be epic at times, the situations and emotions they go through will be relatable to the readership. Family intrigue, backstabbing, and the plots of gods and goddesses would consist of a book reminiscent of the Titans of Myth that were first introduced in the “New Teen Titans” book in the 1980s by writer Marv Wolfman and artist George Pérez. The title of the new book could actually be “Titans of Myth” as an homage to Wolfman and Pérez, adding history to a modern take on mythological characters. Two possible spin-off books in the Wonder Woman franchise could take place in the past. The first book could simply be titled “Amazons” and hone in on the island of Themyscira, the island of Diana’s birth. Focus would be firmly placed on the inhabitants of the island and the interactions between the Amazons and Diana during her early years. The book could then segue over time to the present and depict the rebirth of the island after its decimation by Hera. The concentration on the Amazonian women would be unique for a mainstream comic book because all the main and supporting characters would be female. If placed in the hands of a talented team of writer and artists, the book could sell despite the sole focus on female characters. Not enough women characters have their own book, but by containing a women-only cast, this would be a commendable book and has a chance to be an artistic triumph as well. The second book to take place in the past could center on a young Queen Hippolyta and her life on Themyscira before her demise at the hands of Hera. The book could simply be titled “Hippolyta.” We can find out how she came to rule over an island of women and, at the same time, discover more history about Wonder Woman and how Diana became the woman, or demi-god, that she is today. The book can trace Hippolyta’s life as a child up to her raising and nurturing of Diana. Relationships could be the main focus of the book, with mother and daughter dynamics being explored between Diana and Hippolyta. We’d also get the depiction of Hippolyta and Zeus’ relationship and how that flowered and was ultimately destroyed. We’ll also get insight into the adventures of Diana as a young woman and see the girl become a warrior. If the #0 issue of “Wonder Woman” by Brian Azzarello is any indication, then much humor and pathos can be mined from Diana’s past. These are just some suggestions for books that can build a Wonder Woman mythos into something amazing and deserving of the Amazonian Princess. For too long, Diana has not gotten the attention she deserves in the comic book world. The current “Wonder Woman” book has introduced many brilliant concepts and characters that can help build up a mythos that is just as important and wondrous as that of Batman and Superman. She deserves her place among the trinity. Now is the time for Wonder Woman’s ascent and the blossoming of her own franchise, or Wonder Woman, Inc.